Aspen Art Gallery - Elected 2017 Best Gallery in Aspen by the Readers of the Aspen Times! Aspen Luxury Life, Winter 2017 issue. 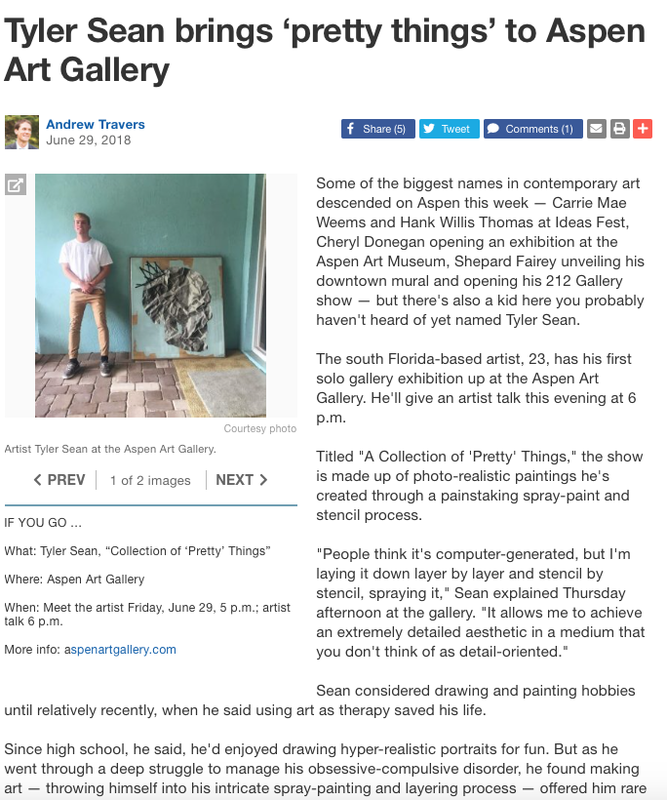 Damian Guillot, and Aspen Art Gallery appears on Fox CW’s (KDVR) Everyday Segment! Aspen Art Gallery announced earlier this year the creation of a new Emerging Artist Program designed to introduce new and talented artists, and give them a chance for national recognition as well as a gallery showcase. As a Diamond Sponsor of the annual Flight to Luxury Hangar Event, presented by CuvéeEscapes, Aspen Art Gallery and its group of represented artists have donated art works to be auctioned at the event, with all proceeds given to Boys & Girls Clubs of Metro Denver. This year, owner Damian Guillot is rolling out something new – a chance for any artist, from anywhere to have a chance to submit their work to be considered by a panel of judges, and gain a chance to participate in the event as an exhibitor. The selected winners will have a showcase exhibiting with Aspen Art Gallery. The judging panel, composed of three judges, have selected the top 100 art pieces to be shown at the Flight to Luxury Annual Hangar Charity Event. These top 100 art pieces will be fully donated and featured in the Flight to Luxury auction with all proceeds benefiting Boys & Girls Clubs of Metro Denver. Guillot will offer the chance of a solo exhibition at Aspen Art Gallery to his chosen top three applicants. This will be a unique opportunity for artists everywhere to receive national attention, gain immediate exposure, and contribute to a worthwhile cause. In the highly competitive art market, a chance to showcase your artwork in such a recognized public event is rare, and even more coveted, is the chance to become an exhibiting artist in a well-known and highly recognized art gallery, such as the Aspen Art Gallery. Any artist who submitted their work, and were accepted into the top 100, did so with the understanding that their work will be showcased as part of the charity auction, and the proceeds will go directly to the charity. The top 100 winners have been notified, and the top three will be chosen at the event by Damian Guillot, owner of Aspen Art Gallery, and will be announced on both the Flight to Luxury website and communications, as well as on the Aspen Art Gallery website. Aspen Art Gallery is the inspired creation of Colorado resident and entrepreneur, Damian Guillot. After Hurricane Katrina, Damian moved to Aspen, Colorado, to set up his own gallery specializing in contemporary, modern, and fine art. His passion and savvy for selecting eclectic and beautiful pieces has led to one of the most successful gallery collections in the country, internationally known for its one of a kind offerings. This success has led to the recent opening of a second Aspen Art Gallery location in the heart of the Cherry Creek shopping district, near downtown Denver. This location now allows Aspen Art Gallery to spread its artistic flair deeper into the local Denver community, and in many cases, provide great exposure and opportunities for Denver’s local artists as well. The annual Flight to Luxury Hanger Party is presented by Cuvée Escapes, and will be held on Friday, September 18, 2015 at Centennial Airport. The event showcases custom-couture private villas by Cuvée, elite jets, exotic cars, and live entertainment, all for the benefit of Boys & Girls Clubs of Metro Denver. To learn more about the event, visit http://www.flighttoluxury.com/flight-to-luxury/ the-event/.